This week I am continuing to look at the Cs of art and the focus is colour. One of my favourite sites for many art ideas is Nita Leland. She has a good section on colour and has also written an excellent book on colour. She provides an extensive listing of books on colour and colour theory. I wanted to create a painting where the focus was mainly on colour - the abstract expressionsists were my choice. I explored one site and loved the work of Franz Kline. His oil painting," Untitled" ( c. 1959, National Museum of American Art, Washington, DC.) drew me. It was this piece I used for my model. I used acrylics and had such fun splashing on colour. Colour and I are one. I am a painter." Paul Klee, 1914. "Instead of trying to reproduce exactly what I see before me, I make more arbitary use of colour to express myself more forcefully ... To express the love of two lovers by the marriage of two complementary colours ... To express the thought of a brow by the radiance of a light tone against a dark background. To express hope by some star. Someone's passion by the radiance of the setting sun." Vincent van Gogh, 1888. "Colour helps to express light, not the physical phenomenon, but the only light that really exists, that in the artist's brain." Henri Matisse, 1945. I have a giveaway for my 200th + post! Check it out here. Shadows are being tracked down all over the globe today - to bring you shadows in all forms and places. We have had a real cold snap this week. In fact, at my school yesterday, both recesses were indoor as the wind chill was -20 (Celsius!). Be sure to check out the other great shadow chasers at Hey Harriet! Thankful/Thoughtful Thursday and A Giveaway! At the start of today, I really wondered what I would find to be thoughtful for and as the day unfolded, there were a few things but a also a major difficulty. I have one student who is ODD - very oppositional. He did not have a good day and by the end of the day I had to give him a 5 minute detention for pushing another student. The whole issue escalated into a major problem, involving his mother. The short story - I ended up having to call CAS (Children's Aid) on the mom. I have only had to do this a few times in my teaching career but each time it is so difficult. But I know it is not for me to decide what the outcome will be, I have to do it based on my concerns for the safety of the child. By the time I got home I was exhausted, worn out by the events of the day. My husband surprised me with a dinner out, with his son, daughter-in-law and their son. It was a good tonic. I have been trying to visit as many blogs as possible this week - "One World One Heart" started Monday and already there are over 700 blogs participating, with so many wonderful giveaways. Lots to visit before Feb. 15th! Be sure to check it out! A week or so ago I knew my 200th post was coming up but I let it go by before I realized today that this is my 203rd!!!! SOOOO - in honour of achieving 200 posts in less than a year, I am going to hold my own giveaway. 3 winners will be drawn at random on Sat. Feb. 13 and will be notified by email. 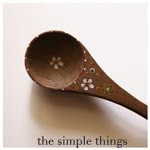 Today Christina of Soul Aperture is hosting the Simple Things blog party. As she says: "it seems that January, can be a tough month for some of us. the blahs, the rain, the snow, trying to make sense of the world. - no matter how big or small, these things may seem." We can all participate by writing a list of the simple things in life that make our hearts and souls sing. But to add to this blog party, for every blogger that posts a Simple Things list on January 27th and links back to the Soul Aperture blog post here, Christina will donate $1.00 to the charity Doctors Without Borders for the Haiti Relief efforts. What a wonderful way to make a difference! Here is my list, in no particular order, of things that uplift me, give me joy, peace and put a smile on my face! A list to keep handy to remember that happiness can be achieved by the simple things in life! Join in the fun - create your own list and be sure to check back to Christina and visit the other participants here. What do you wish to awaken? I have been trying to awaken my creativity this past year and I am much creative than I have ever been. I am involved in ATC swaps, challenges , dreamboards and courses online. I have been involved in 3 of The Next Chapter Book Clubs. But, even though I would like to be called an artist, I don't feel I am one. So, I would like to fully awaken the artist hidden inside me, to awaken the creative spirit and positive energy necesssary to be one. I want to continue to grow artistically and seek mentors to help in that growth. "You can be a maker of magic and a tender of wishes. It’s easy. Support wishes by visiting other participants. There is great power in wishing together." This week at ABC Wednesday the letter to focus on is B.
I chose - B is for Balloon. My husband , stepchildren and their families suprised me with a birthday party at Swiss Chalet 2 weeks ago. This balloon was at my spot. What a lovely treat. This book was also a birthday gift and I really enjoyed it. I have read all of Mitch Albom's books now. So, B is also for Birthday! Be sure to visit the other great participants here. We are now into Round 6! This week starts a long look at the Cs of art. First up is COLLAGE - my absolute favourite. There is no wrong or right, there are so many materials that can be used and so many effects that can be created. Creating the full moon dreamboards each month with Jamie Ridler uses collage. It can be as simple as finding magazine images and gluing them on a background in a meaningful array to the artist. Many collage artists use mixed media in their works which can be very detailed. 1. doing a colour collage - to find the different shades and tints of a chosen colour. Picasso, Matisse, Max Ernst, Robert Rauschenberg, Romare Bearden (as well as the above 3 artists). I know there are many other places - maybe you could let me know! Right now I am working on collages for the "Deck of Me" challenge and vision cards (as described by Jamie Ridler). Both have been enjoyable but I still have more work to do! I am also using collage elements in some of the ATCs I created this week. I know I will continue to collage. I love the mess of it at times but there is something about seeing your vision take shape. Next week - more of C - as I focus on Colour and Composition. Once again it is time to share shadows we have discovered this past week. There were a few sunny days - it is hard to believe it is January with the plus temperatures and lack of snow we are experiencing herein Southern Ontario. Be sure to visit the other great shadow chasers at Hey Harriet!, hosted by Tracy. This week's sharing of what I am thankful for and what has struck me this week, what I have learned or experienced is as follows:"
1. I have learned (once again!) that you must take all the time you need to recover or the next setback will be worse! Again I am home from work, this time with bronchitis and an ear infection! Ugh! 2. I am so thankful for our health care system and dedicated doctors, nurses and pharmacists who take care of us. 3. I am thankful for friends who call with concern and offer prayers. "Still Alice" by Lisa Genova and "Have a Little Faith" by Mitch Albom - both dealing will disturbing subjects (alzheimer's and death) but done beautifully. 5. I visited a number of new blogs this past week and one was Brushstrokes From the Heart. Very down-to-earth. She has an art blog, with her studio in her laundry room. I love the idea of working with what you have and just creating! 6. I am thankful for laughter - from and with children, with my husband. And of course, from "American Idol" - I will not forget "pants on the Ground!" 7. Thanks to Collage Diva, Kathryn Antyr, for her excellent course "Personal Retreats". I have completed my first week and am working on my house. she asks us to list the go-to websites that we might keep at the top of our favorites. It should be a a list of non-blog websites that really help a person out. 1. Atcs for All - this is the site where I pursue swaps and look at galleries of great cards. 2. Creative Every Day - This site brings artists from all over the world to a place to share their art and gain inspiration from Leah. If you haven't been here, you must! 3. Jamie Ridler Studios - This is home to Wishcast Wednesday, Full Moon Dreamboards and much much more! Jamie Ridler also holds The Next Chapter book clubs. 4. Nita Leland - I have several of her books and enjoy going back to her sebsite for inspiration and lessons. 6. Bucket Fillers - I have used their books to introduce the notion of filling each other's buckets with my class. They really enjoy the ideas and it tends to work. I get weekely updates with great ideas. 7. DRF - my husband's father and grandfather raised and raced thoroughbreds. Marrying into this family meant I got involved in watching horse racing. So this site, brings information on horses, jockeys and the march to the Kentucky Derby! It is once again a time for wishcasting! I have always wanted only the best for my extended family. For the past 2 years , with the turmoil of my mother's illness and then death, causing division between my siblings and myself, I have felt estranged from them. We communicate, but just out of politeness. I don't know if we will ever recover what was lost. But, my wish is that we can create new bridges that will restore the sense of family and connectedness we had. With my own children, I wish that they achieve what they seek, that they have health and happiness beyond measure. For my stepchildren and their children, I wish for prosperity, happiness and good health for all. "You can be a maker of magic and a tender of wishes. Support wishes by visiting other participants. There is great power in wishing together." Visit the other great wishcasters here. A B C Wednesday Round 6!!!!!! Yeah! A new round of ABC Wednesday has begun! This will be my second full round and I am so enjoying the challenge and the visiting of other bloggers to see how they answered the challenge. This week - A is for ATCs. This past year I have been exploring my creative side more and more. I have been expecially enjoying the ATC swaps at ATCforAll. I have made penguins, trees, zentangles, flowers. And there are many more swaps to come! These Artist Trading Cards are typically 2 1/2 by 3 1/2 inches in size and can be any medium or theme. They are not for sale but are traded, usually 3 for 3 or 6 for 6. They are fun to create! This past week several blogs I visited really stressed the need to play at one's art, to have fun. Today's focus allowed me to do just that. I first played with acrylic paints. The term blot painting, blotto art, and even blotter art have all referred to this process. Creating blots with paint is something I have always done with children. A simple process really - fold a sheet of paper, drop or squirt different colours of paint on the paper, refold the paper and spread the paint around. No two blots are ever the same and you never know what will emerge. I used two different types of acrylic paint but wasn't as happy with the first as it was thicker and really didn't blend or spread. The second blot I made with a more liquid paint (folk art paint) and used a bit too much paint but I did like the effect in the end. The third blot began with much less paint and then I kept adding until I was reasonably satisfied. I have not used lino blocks to print but would love to take a course to study printmaking in depth. I usually use syrofoam - plates and trays to do simple printmaking with children. I created a couple of simple designs to show this process. I do enjoy seeing an image appear from a block that I have carved. I created more ATCs this weekend as well. I signed up for a large number of swaps and now I am trying to get them done asap. It is time once again for Shadow Shot Sunday - where shadow sleuths around the world hunt for shadows! It becomes addictive as you seek those shadows. We had a few sunny days this past week so it was a bit easier to find shadows. I grabbed my camera one day as we were driving and found some great tree reflections! Be sure to visit the other great shadow chasers at Hey Harriet! Today has been a day to restore myself - to rest, step back and recharge myself. I have let myself get rundown and am now fighting fatigue and a cold. Sleeping in, hot packs on my neck, reading inspiring words has helped. "Thanksgiving Thursday" (from Amanda at Persistent Green", "Weekly Gratitude" and "8 Things Thursday". "8 Things for Thankful/Thoughtful Thursday". *a course from Collage Diva which I started today (Personal Retreats). I am so looking forward to it. Thank you so much to all three of you wonderful ladies.\! 2. I was extrememly thankful to have been totally surprised with a birthday dinner last Saturday by my husband, three stepchildren, and their families. What a lovely surprise! 3. I am thankful for my students who did not want me to leave yesterday at noon when I wasn't feeling well. I do have some very sweet kids. 4. I had a health scare Tuesday night and it really got me thinking about my mortality. The next day I came across a blog that asked: "If I had to write an autobiography now, what would be missing from it? What are the things I will need to get done before it takes shape?" There were a series of questions to answer and I am slowly working through them. In this year of YES, it is very appropriate and timely! 5. I am thankful for Mary Ann (xstitcher) who turned a postal problem into a new friendship and a great ATC swap. (I had spent $13 to send my cards xpresspost to her and was told it would take 5 days to get the cards there. It took 19 days! Needless to say - the cards did not make the swap in time, but Mary Ann made one for me and included 2 other cards so that I could have some! What a generous person! And we had fun trying to track the cards and writing back and forth! 6. I am so thankful for all the bloggers who have visited my blog and left such encouraging comments, especially this week. 7. I am really enjoying creating the ATCs. The swaps are enjoyable and it is like Christmas everytime a new batch arrives. 8. Thanks September Mom for sending the five words for the word association meme (You write about the first word that comes to your mind when you hear the "trigger" word.) (I discovered Sunday Citar from her - it is a lovely place to visit each Sunday). refreshing - Water - whether it is to drink, swim in or soak in, it is refreshing! escape- Books - Books have always been my escape. I am hoping this year to read much more! color- Red. I love the colour red and feel so good in it. open- Door. I want to open the door to new things and new people this year. chocolate - Lindor - These are my favourite chocolates - melt in your mouth! Just recognizing the good things that have taken place this past week really does gladden the heart and lighten the load!